Enjoy winter with Fishdom! Cheer up and spread the merriment of crispy clear days around! Use your imagination to recreate the nippy and fun atmosphere of winter in your tank. 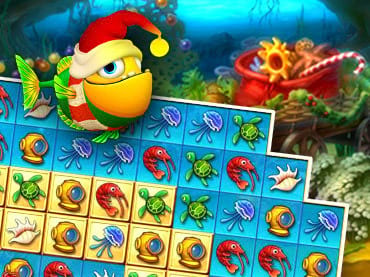 Earn money as you complete challenging match-3 levels and use it to buy festive fish and winter-themed decorations. If you're looking for a cute holiday themed game that the whole family can enjoy, than this might be a good choice. Download free full version pc game now and get splashed with frosty joy in this sparkling and snowy sequel to Fishdom! If you have questions about Fishdom Frosty Splash game, please contact us using this form.